113 Marlborough is located on the north side of Marlborough, between Clarendon and Dartmouth, with 111 Marlborough to the east and 115 Marlborough to the west. 113 Marlborough was designed by architect Charles K. Kirby and built ca. 1872, for speculative sale, one of a symmetrical pair (113-115 Marlborough) built at the same time, and one of six contiguous houses he designed in 1871-1872 (105-107-109-111-113-115 Marlborough). 113-115 Marlborough probably were built by James Henry Standish, a carpenter and builder, who built 111 Marlborough at about the same time. Charles Kirby purchased the land for 113-115 Marlborough from the Commonwealth of Massachusetts on September 3, 1872. On August 19, 1872, he purchased a seven inch strip to the east from James Standish, under the party wall with 111 Commonwealth, and on November 1, 1872, he sold him a six inch strip to the west, under the party wall at 117 Marlborough, which James Standish was building. Click here for an index to the deeds for 113 Marlborough. On September 15, 1873, 113 Marlborough was purchased from Charles Kirby by Martha J. (Hamblin) Elms, the wife of wholesale dry goods and shoe merchant James C. Elms. They previously had lived at 24 Worcester. 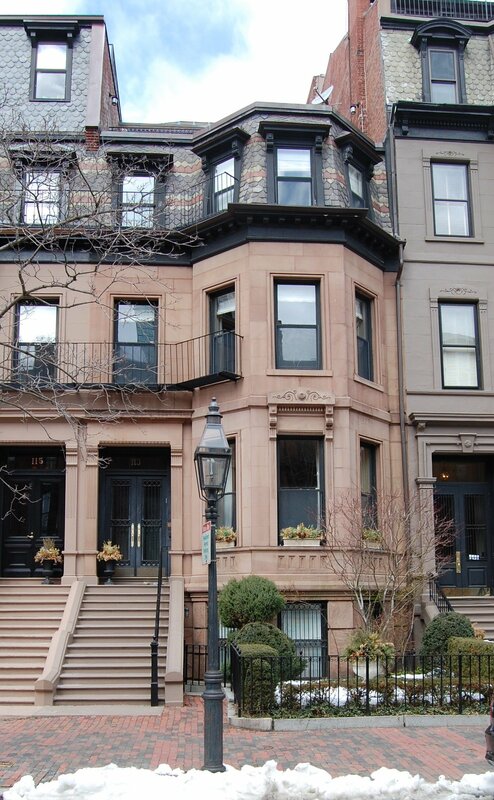 They continued to live at 113 Marlborough in 1877, but had moved to 118 Newbury by 1878. On August 8, 1877, 113 Marlborough was purchased from Martha Elms by Mehitable (Swain) Livermore Maynard, widow of John Frank Livermore and of Harrison E. Maynard. Harrison Maynard had been a wholesale flour merchant and had an extensive art collection. He had died in January of 1877; prior to his death, they had lived at 65 Bowdoin. Helen Sophia Farnsworth Livermore, Mehitable Maynard’s daughter by her first marriage, lived with her; she died in March of 1880. Mehitable Maynard married again, in June of 1880, to Dr. Morris H. Henry, a physician in New York City. On October 9, 1880, 113 Marlborough was purchased from Mehitable (Swain) Henry by attorney Henry Clinton Hutchins. He and his wife, Mary Louisa (Grout) Hutchins, lived at 215 Beacon. By the 1880-1881 winter season, 113 Marlborough was the home of the Hutchinses’ son and daughter-in-law, attorney Edward Webster Hutchins and Susan Barnes (Hurd) Hutchins, who married in December of 1881. Henry Hutchins died in October of 1894 and 113 Marlborough was inherited by Edward Hutchins. Edward and Susan Hutchins continued to live there during the 1896-1897 winter season, but moved thereafter to 166 Beacon. 113 Marlborough was not listed in the 1898 Blue Book. On July 29, 1898, 113 Marlborough was purchased from Edward Hutchins by real estate broker and investor Frederick Augustus Whitwell. He and his wife, Mary Crowninshield (Silsbee) Whitwell, made it their home. They previously had lived at the Hotel Charlesgate at 4 Charlesgate East, and prior to that at 230 Marlborough. Their daughter, Natalie Silsbee Whitwell, lived with them. 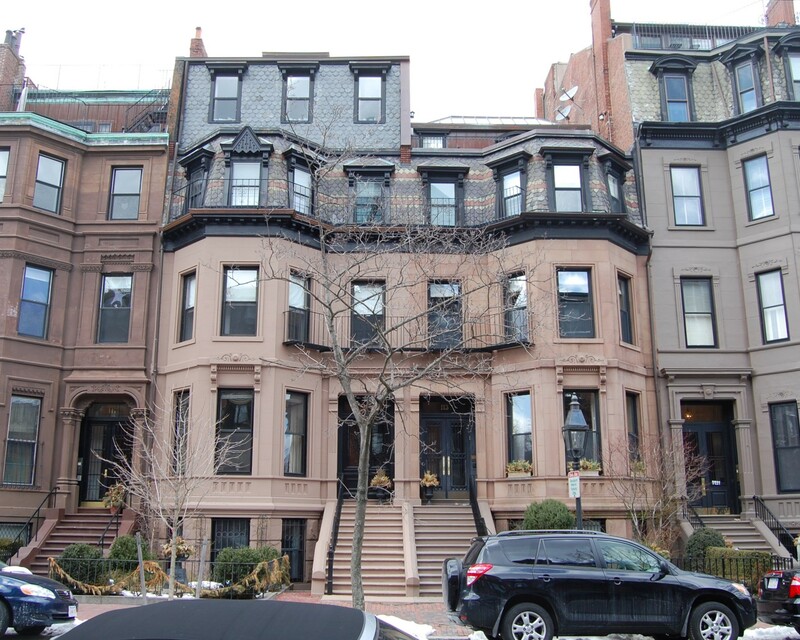 During the 1905-1906 and 1906-1907 winter seasons, they were joined at 113 Marlborough by their son and daughter-in-law, Frederick Silsbee Whitwell and Gertrude (Howard) Whitwell, whose own home, at 166 Marlborough, was temporarily leased by Mrs. Henrietta Clementine (Bright) Inches, the widow of John Chester Inches. Frederick S. Whitwell was an attorney and real estate investor. He and his wife had moved back to 166 Marlborough by 1908. Frederick Augustus Whitwell died in July of 1912. Mary and Natalie Whitwell moved soon thereafter. During the 1912-1913 winter season, 113 Marlborough was the home of cotton broker Rudolph Weld and his wife Sylvia Caroline (Parsons) Weld. They also maintained a home in Wareham. 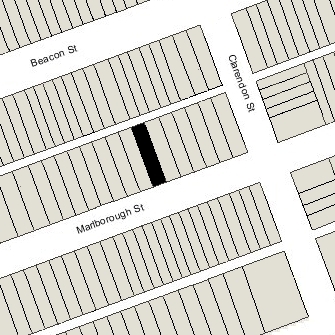 They had moved from 113 Marlborough by the 1913-1914 season, and by 1915, were living at 5 Marlborough. On June 12, 1913, 113 Marlborough was purchased from Frederick Whitwell’s estate by Mary Waldo (Lincoln) Davis, the widow of Joseph Estabrook Davis. She previously had lived at 154 Beacon. Joseph Davis had been a manufacturer of railroad supplies and served as a director of the Worcester and Providence Railroad. She continued to live at 113 Marlborough until her death in 1927. She also maintained a home in York Harbor, Maine. 113 Marlborough was not listed in the 1928 Blue Book. On December 12, 1927, 113 Marlborough was acquired from Mary Davis’s estate by Dr. John Lewis Bremer, Jr. He and his wife, Mary Cleveland (Bigelow) Bremer, made it their home. During the previous season, they had lived at 295 Marlborough, and prior to that at 416 Beacon. John Lewis Bremer was a physician and professor of histology at Harvard Medical School. 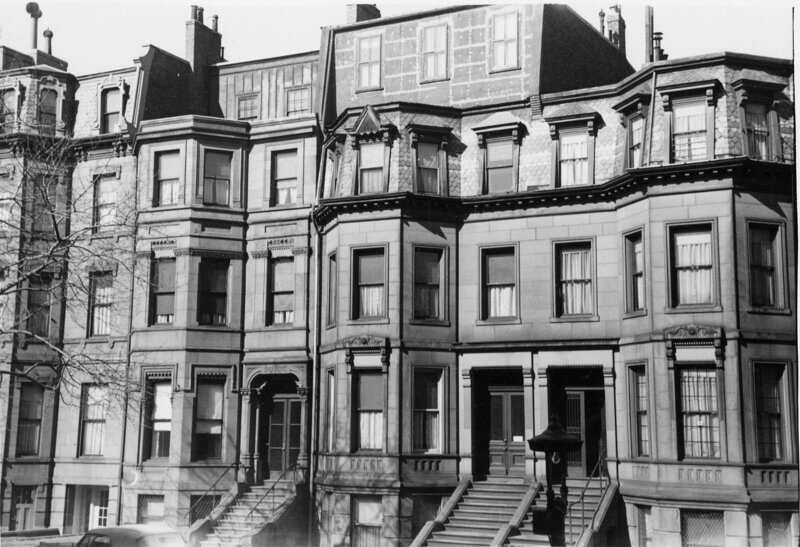 The Bremers continued to live there until his death in December of 1959. On August 10, 1960. 113 Marlborough was purchased from John Lewis Bremer’s estate by Malcolm Stephens (Stevens) Loring, an engineer, and his wife, Anne (Russell) Loring. They lived in Sharon. On December 15, 1960, 113 Marlborough was purchased from the Lorings by Ford Hilliard Cooper. He previously had lived at 82 Pinckney. He was an architect and artist. He continued to live at 113 Marlborough until his death in December of 1983.